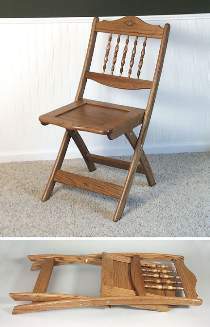 This folding chair has the look of fine furniture, yet it has been designed so the average woodworker can make it easily. Make several as good folding chairs should be a staple in every household. This chair, pictured in oak, is sturdy and very comfortable. Folds for compact storage, and so simple to make with our FULL SIZE patterns. Folding Chair Hardware. Includes 8 carriage bolts, nuts, washers, two 3.5 straps, five 9in. oak spindles, and 1 square foot of oak plywood.